With the development of the largest McDonalds in the UK alongside the opening of L1’s latest chain; Byron Burger, selling burgers to the people of Liverpool isn’t exactly like trying to sell ice to the inuits. If you are burger lovers like us, it might be quite easy to be distracted by the stature and impressively sized building which tower over the surrounding shops. They are both giant Goliath’s in their own right in the Liverpool One food scene. Don’t let the attractive interior and queue of burger fanatics standing outside convince you it’s the only burger place in town as there is a place called Free State Kitchen on Maryland Street serving up a bit more than ‘posh Big Macs’. Their contemporary twist on American classics alongside their mantra of sourcing locally makes this place a must. The modern burger is a far cry away from what it used to be, back in the ‘good old days’ people simply saw it as squashed beef in a bun with some sauce to the side. These days, the world of the burger has gone gourmet and FSK are at the forefront of this revolution. Whilst adhering to some sort of burger status quo on the menu by offering your everyday burger, they are also transforming the protocol patty with it’s more unusual offerings. After a marvel over their special menu, we decided we had to try their ‘Mac ‘n’ Cheese burger’ and the ‘Goober burger’. Whilst still quite confusing to process, the first burger is self explanatory in its ingredients. The most accomplished burger aficionado might not have entered the realms of the Goober which is a beef burger topped with a fried egg, caramelised onions and peanut butter. It isn’t hard to decipher that this burger was inspired from the United States where it originated and became infamous through American food programmes. Whilst confusing our tastebuds, the combination of a soft brioche roll, silky smooth peanut butter and the fried egg was a miraculous combination that sparked off a debate between ourselves of how the makeup of this burger was derived. We went in blind into how the two worlds of burger and mac ‘n’ cheese could possibly collide. Whilst enjoying both to an equal degree, we were anxious about how they would taste together. To our surprise, the creamy cheese goodness of the pasta accompanied the ground chuck which was covered in a sharp mustard, adding a real complex depth to eat bite. The yin and yang was a harmonious delight and we will eat every other burger from now on with distain due to it’s lack of mac. FSK has a really great atmosphere; we have always been big fans of being a few feet away from the chef so we can watch him construct our concoction of cow. It itself it is a statement in the fact they are so proud of how fresh and made to order their burgers are, they are willing to show it off, literally. Despite only being open a few months now, they have built up a great amount of respect and loyal customers. The place itself is mnemonic of an American Style Diner where people come to chow down, all not forgetting to tightly fix their napkins around their neck in an attempt to avoid a frantic couple of minutes of Google-ing how to remove burger stains of a suit, followed by the bounden and embarrassing duty of clearing your search history. 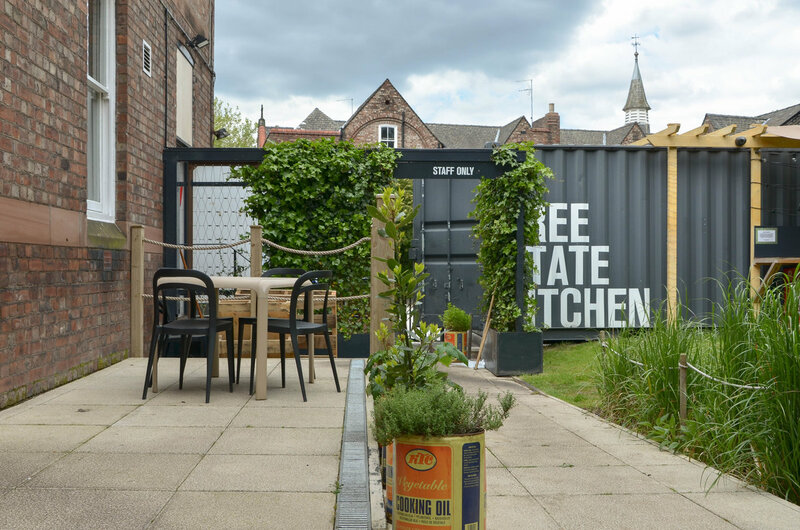 Head outside and you will be immersed into their secret garden; if we gave awards out we would give them the award for the most beautiful beer garden in Liverpool. Take advantage of these summer months and make sure you take a seat outside. 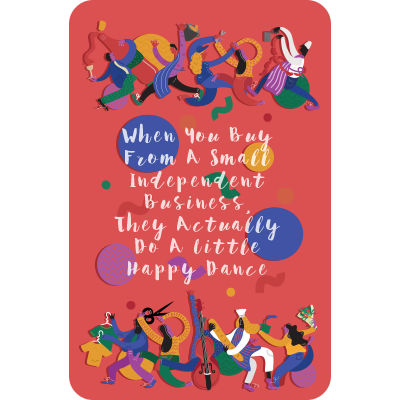 So, it can be quite easy to become overwhelmed with the amount of places offering burgers in Liverpool but we are here to offer our independent input into the debate. 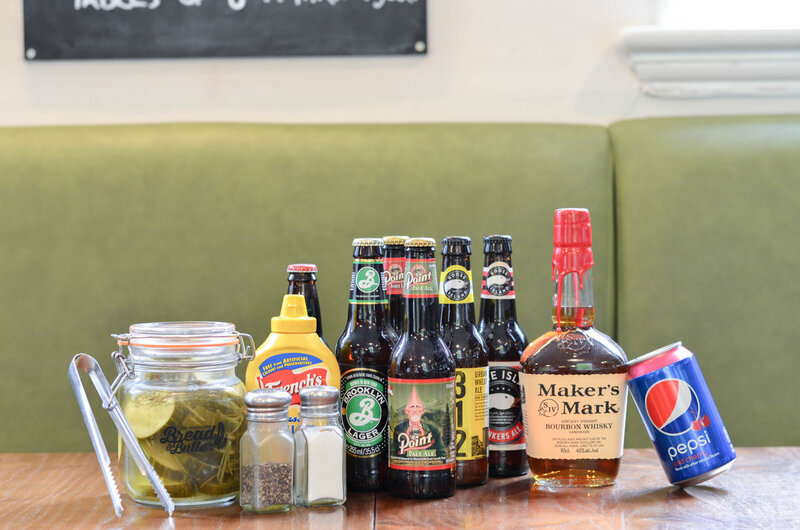 Far more than just a burger joint, FSK offer a plethora of other bites to eat such as amazing salads (we recommend the cranberry and pecan) and homemade desserts. If you are a deli-meat enthusiast make sure you order a Reuben, which has been notorious for satisfying New-Yorkers for years now. Seafood lovers, do not despair as they offer a delicious “Clam-Sam” which is a superlative use of seafood. For reasonable prices and unbeatable quality, we urge you to put down that Big Mac, swipe away your Byron Burger and head to Free State Kitchen to explore the world of gourmet. 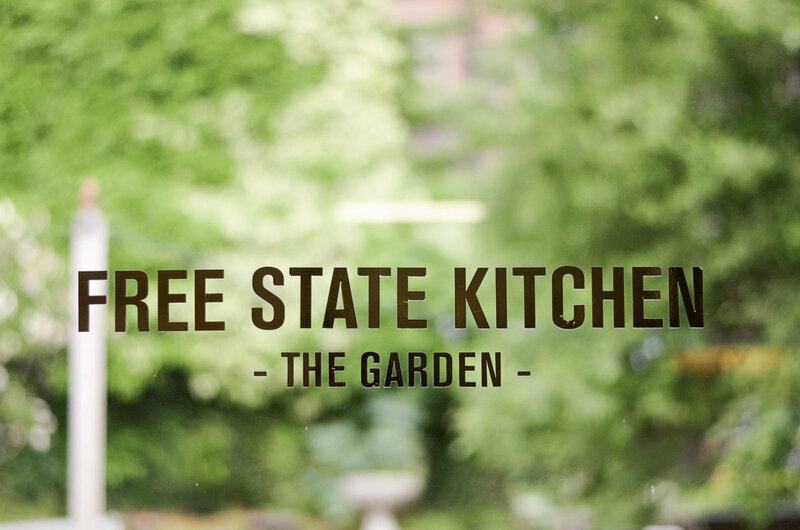 Follow them on Twitter @FSK_Liverpool, like them on Facebook ‘Free State Kitchen’, visit their website to see the rest of their menu http://www.freestatekitchen.co.uk/ but more importantly head there today. Cardholders get 10% off menu food.